Nanotechnology can be used to help break down bacteria on surfaces such as building walls, because certain nanoparticles can act as photocatalysts, using energy from sunlight to cause reactions between organic molecules and the oxygen in water vapor. A company call EcoActive Solutions makes OxiTitan a transparent antimicrobial coating that can be applied to walls and many other surfaces. 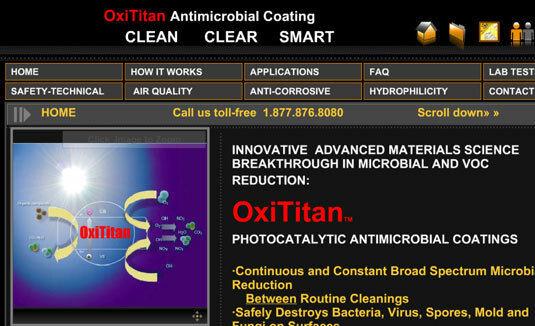 OxiTitan uses zinc nanoparticles and nanocrystalline titanium oxide to break down bacteria. The coating is a photocatalyst, so some light is needed. Artificial light will do the trick, however, so the coating works indoors. Using OxiTitan in buildings such as your doctor’s office, which is exposed to many germs on walls, countertops, and doorknobs, might prevent your trip to the doctor from making you sicker. Bioni makes several versions of paint containing nanoparticles of silver. 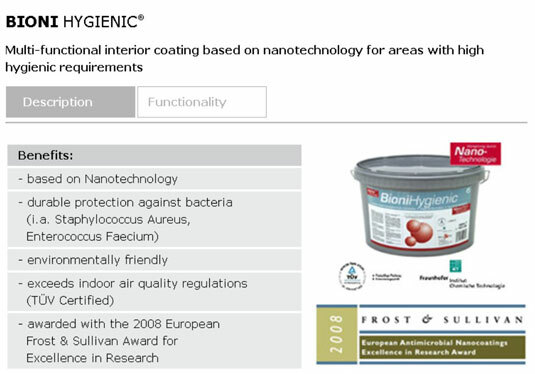 BioniHygienic is used in buildings such as hospitals and doctors’ offices to help kill bacteria, and BioniNature is used in homes. Both products are designed to prevent the formation of mold and mildew in rooms such as bathrooms. Bioni’s exterior paint contains nanoparticles of silver that help to stop the formation of moss and algae.